Beautiful baby girls white bow frilly lace kickers, perfect for all occasions including a christening, wedding, party etc. These beautiful white poly-cotton knickers have two large rows of deep lace, with a satin bow to the centre. Elasticated waist and legs for the perfect fit. Was so relieved when I found this website!!! Ordered Tuesday at 3.30pm and was on my door mat by 11am on Wednesday!! Beautiful quality product and lovely fit! Also can't argue with the price! 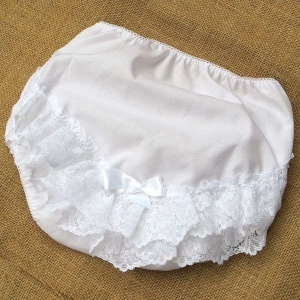 The detail in these knickers is lovely, the lace also helped puff up the dress giving it a fuller look, perfect!